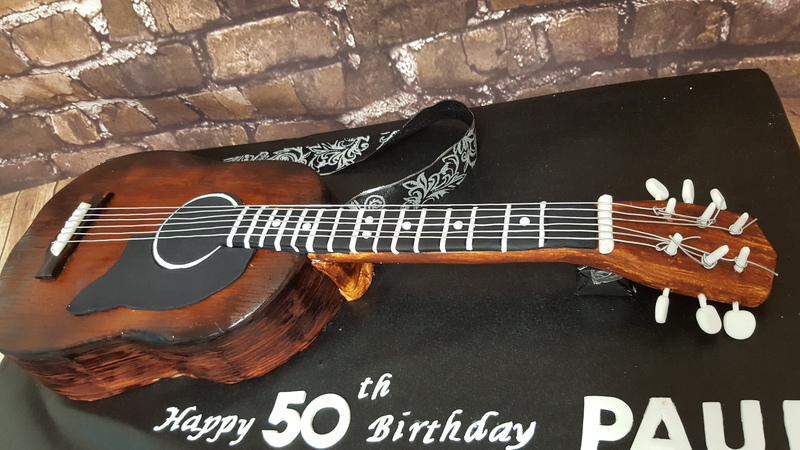 In this tutorial, Serdar will teach you how you can make this realistic acoustic guitar cake yourself. 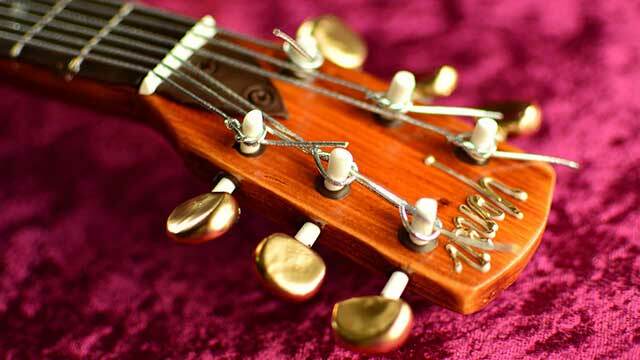 Everything from the staining the woodgrain, modelling the neck and head, attaching the strings and making sure everything is secure. 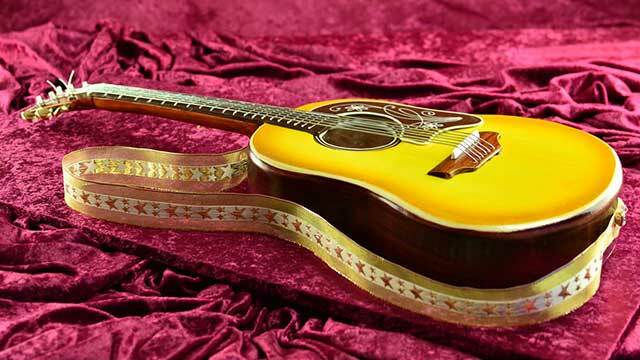 The biggest challenge with this guitar tutorial is to make the neck and the head align with the top surface of the guitar (just like a real one) so that the strings are all perfectly straight and stretched while the head is not touching the board. Chef Yener will show you how to achieve this and much more! 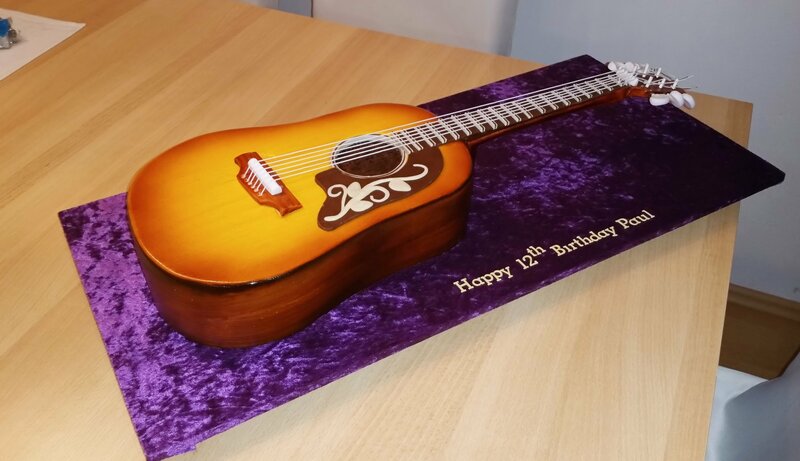 This PDF contains the actual size blueprints for the guitar cake, as well as actual size templates for the cake, saddle and head of the guitar cake. 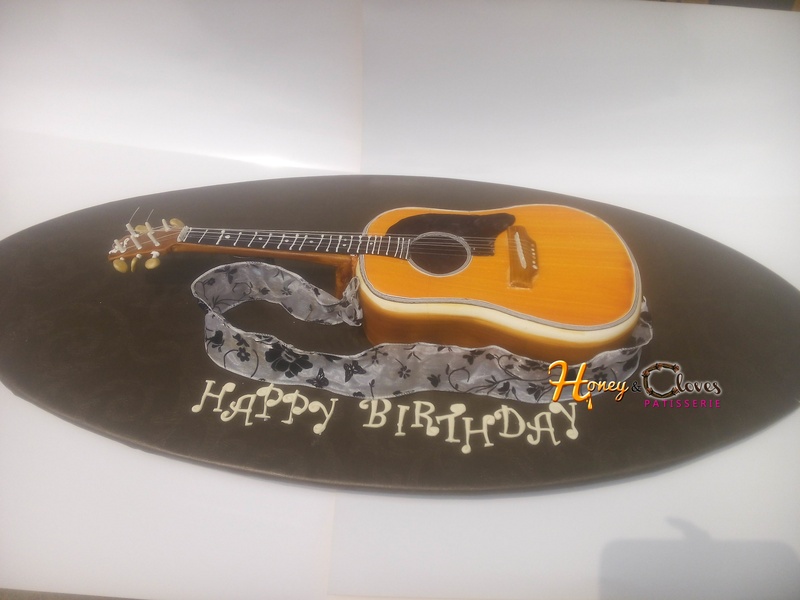 75cm x 35cm (9mm thickness) Rectangular cake board covered with fabric and plastic (cellophane). 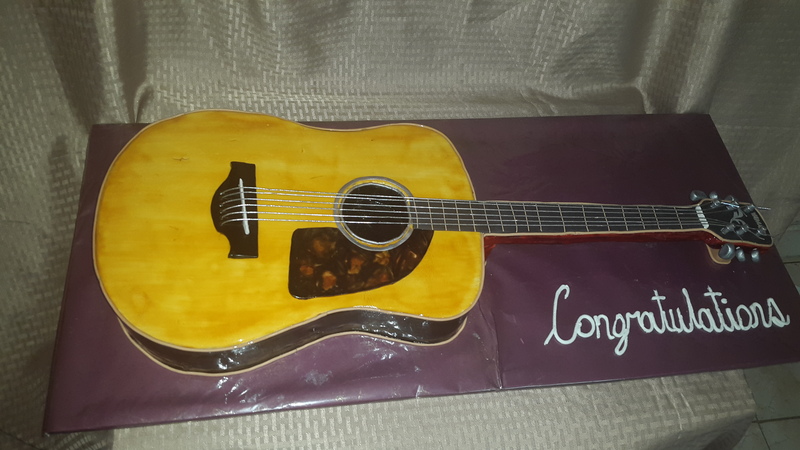 Used this tutorial to make a guitar cake for my son’s birthday. First attempt was not bad. 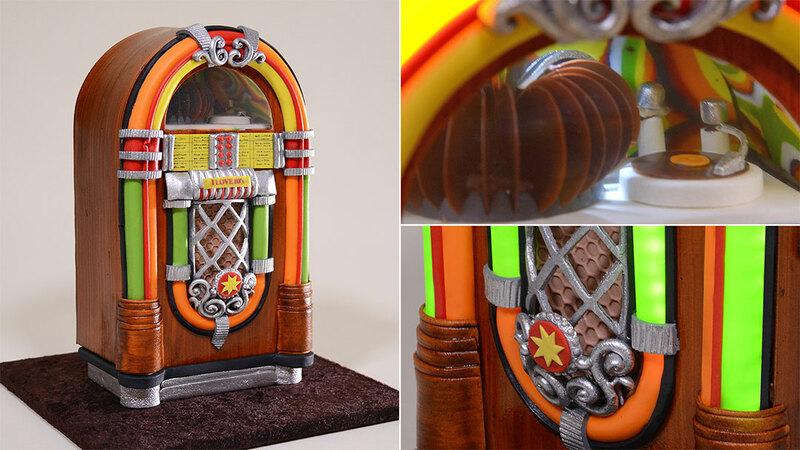 Just wondering if there is a list of all the items used to make guitar anywhere? 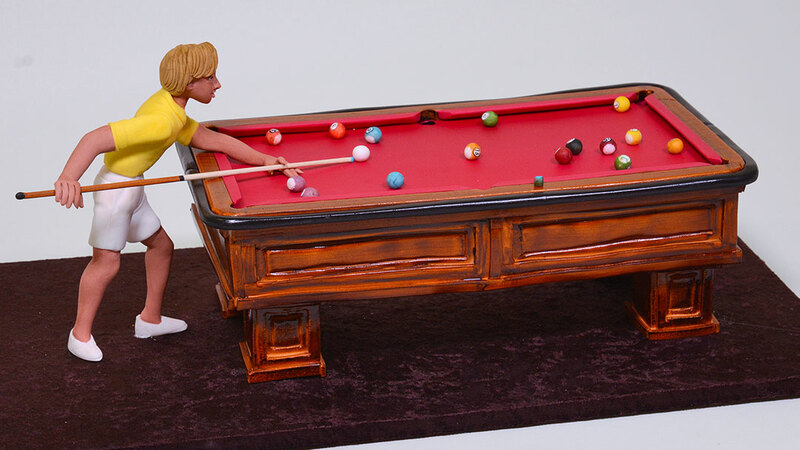 I’m going to be making another one for a friend and live in a small town so will need to order supplies now. 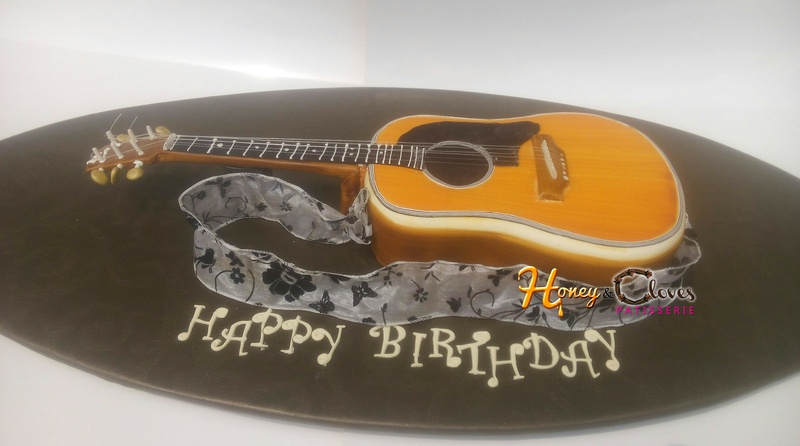 Thank you,this tutorial is amazing so easy to follow.I have a cake order of acoustic guitar on Feb 25.I can’t wait to make one…hopefully mine turn out as good as yours. 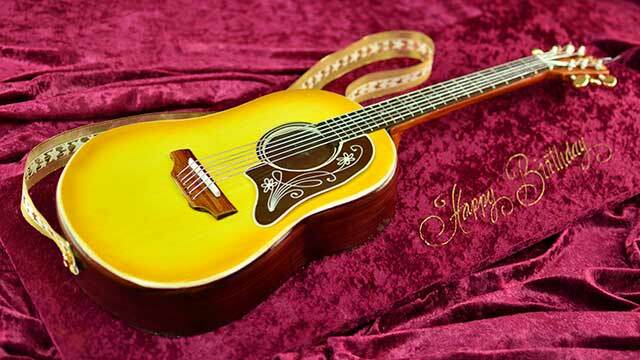 Just a question what is the name of the string that you used? Hi, I love your work and how you teach! 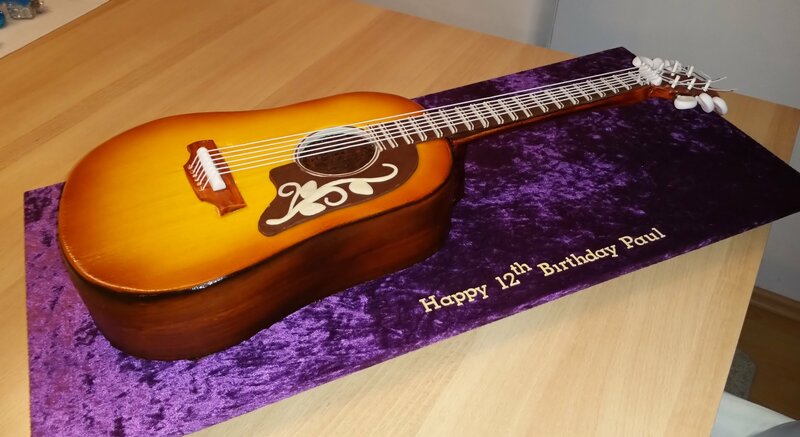 What would it be the serving size for this guitar cake? Some one asked to do it but would like 40 servings. If I am going to make a standup guitar will the pas tillage not going to fall? Hello master!, thanks for yours tutorial, u’re great!. I have a problema, i can’t seem to access the guitar tutorial, am i doing something wrong? i try logging out and logging back but the problems is here yet. Be nice to your self . Some times I am looking for my keys which is holding in my hand. I can’t seem to access the guitar tutorial. It is only showing me the preview from you tube. Am i doing something wrong? The other tutorials were perfect. Love your classes thank you. Hi Lubomira, sorry for slow response. Please try logging out and logging back in. This should fix the problem. Thanks! 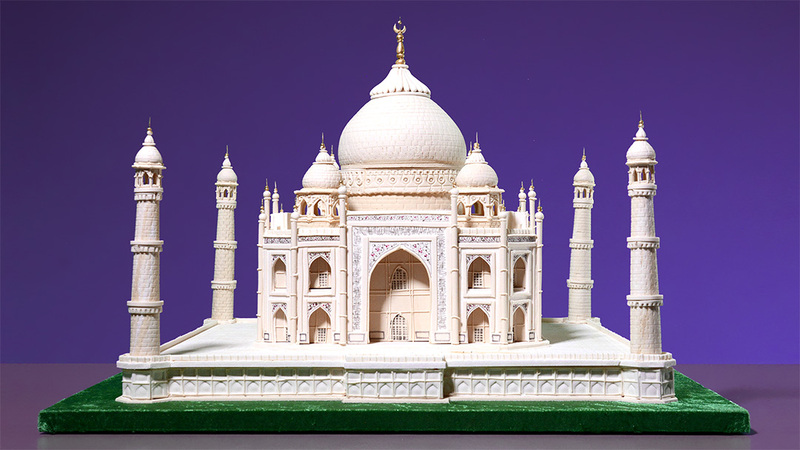 I think you can convert the shape to the one you looking for . Good thing is you don’t have to make the neck in the air. 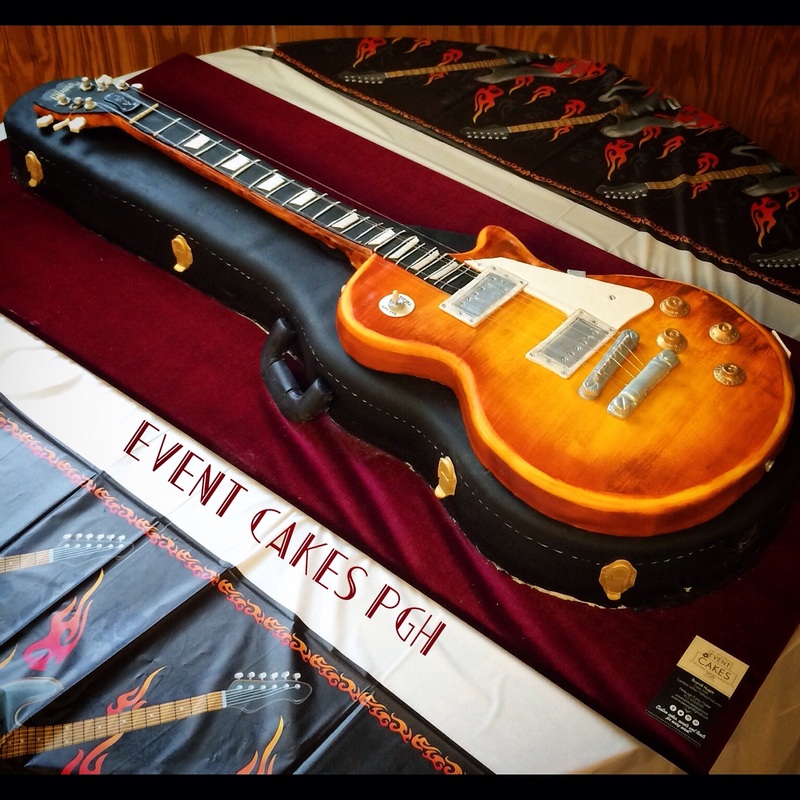 because electric guitars are thinner. I would like to advice you make your drawing the top and side view . Plan your steps if there is a question mark ask me I let you know.. Thank you for this absolutely totally professional tutorial.That was more than I expected.I will keep buying lessons from you and hopefully one day we will meet in person so I can shake your hand and say thank you. God bless you. Hello! You’re work and detail to instruction is amazing! 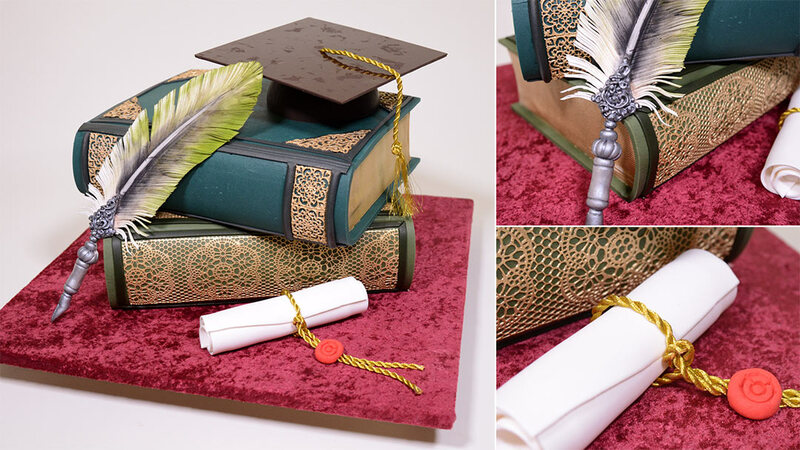 Thank you for inspiring and educating up and coming cake artists like myself! I do have a question, I am new to the site, so I’m not sure if this is the appropriate place to ask. I live in a small town in America where certain ingredients in pastillage are not available. 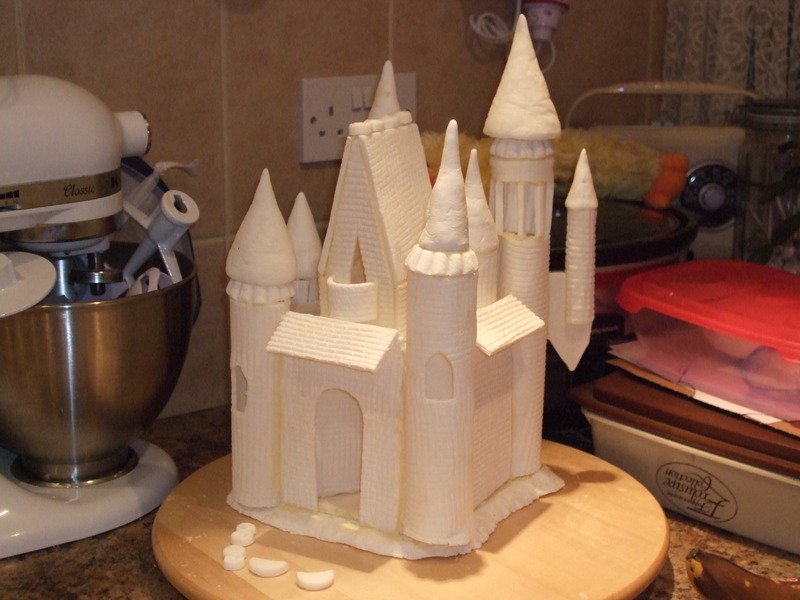 Is it possible to use gum paste with 3 days drying time? 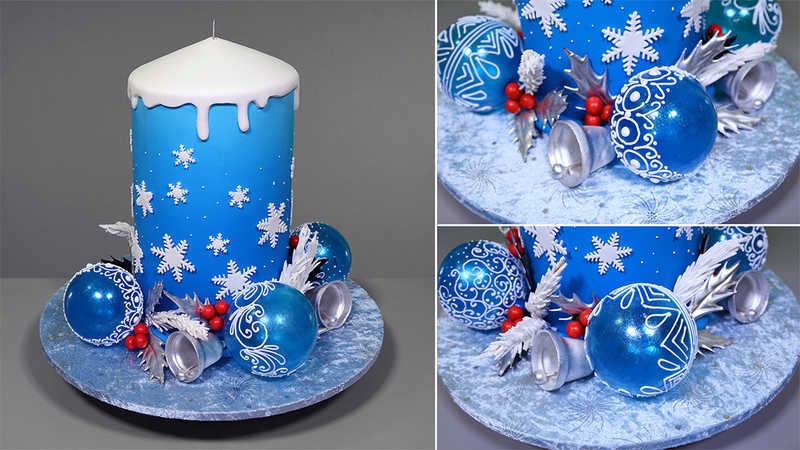 There is many occasions you can use gum paste instead pastillage . 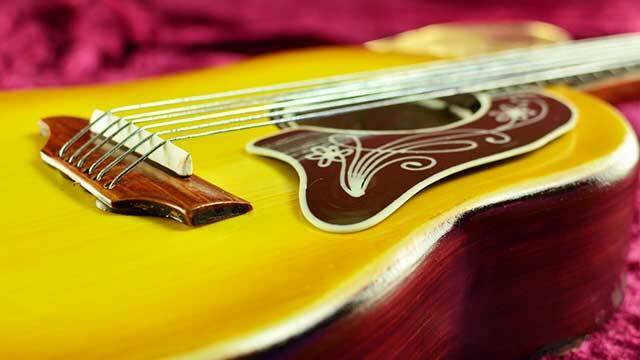 But for the guitar neck and the bridge you need absoulute hardness thats why pastillage will be the only solution . What is not available in your town? OMG!!! You are so awesome. I really enjoy this class. You are the best I have seen yet. I’ll always will say it.. love your work, and how you work, so clean. 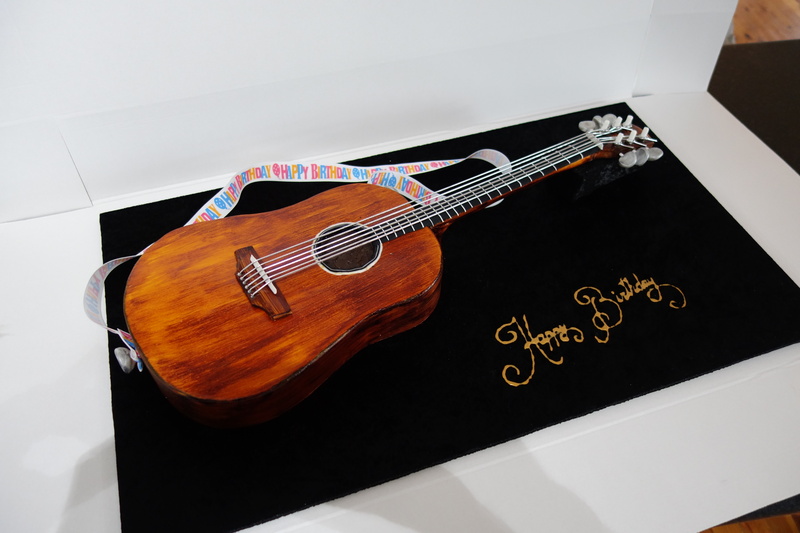 Beautiful Guitar Cake looks so real. I always feel so excited to see the end results. God bless your amazing talent. Thank you. Merry Christmas and a Happy New Year. Thank you. Merry Christmas and a Happy New Year to you too. Wow is this real can’t wait to see how it going to turn out………….. WOW!!! 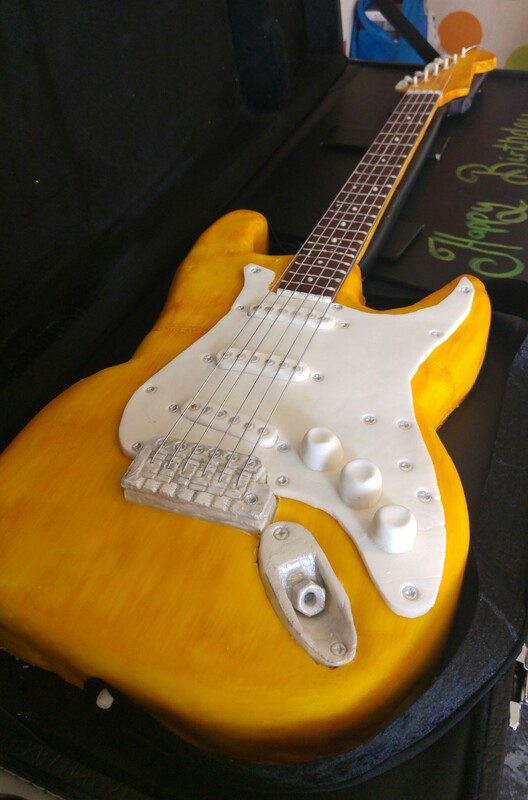 What an awesome cake! I am absolutely amazed by your talent and creativity! Do you have any idea, timewise, when this video will be available for purchase? 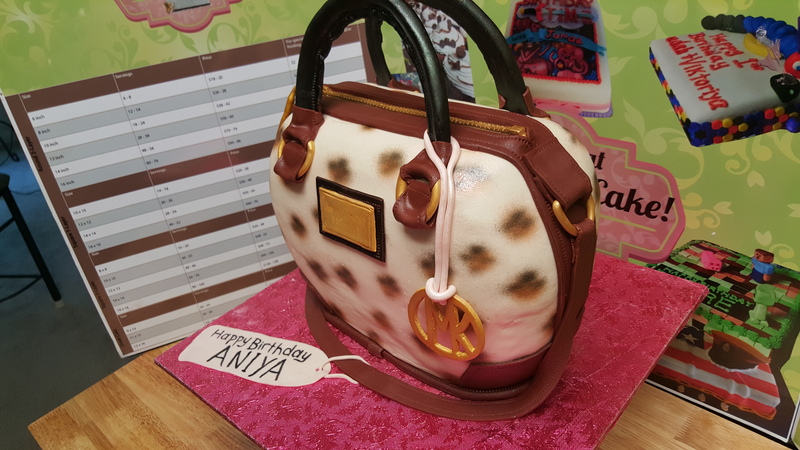 It’s awesome looking cake !!! Great job !! !